From my vantage on Ottawa Street, it took me over 30 photos to capture the procession of Michigan PPC activists as they marched to the state Capitol. Biggest crowd yet!! 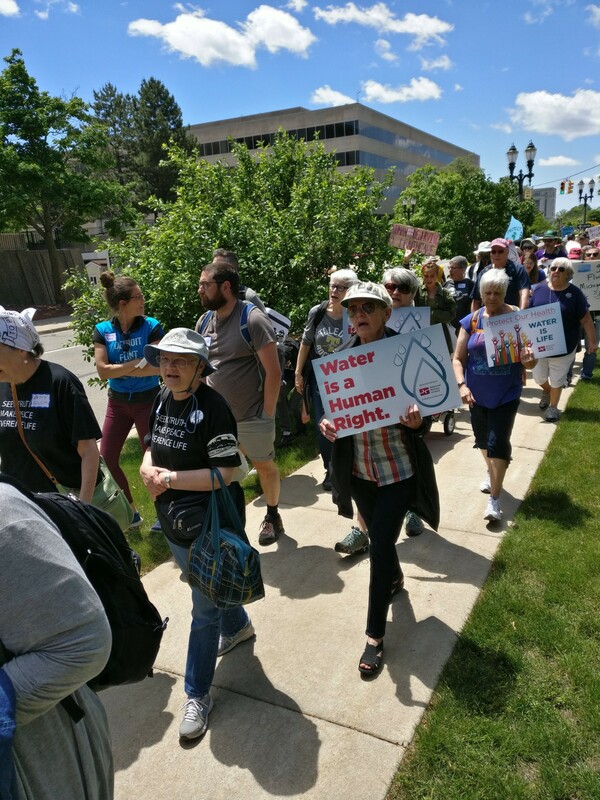 During its fourth week of a planned six weeks of protest, Michigan PPC activists were met with welcome, arrests, and an incidence of violence against a Jewish protester by a woman leaving Constitution Hall, where Michigan’s Department of Environmental Quality has its offices. During the pre-action planning meeting at Lansing’s First Presbyterian Church, it was obvious that the Michigan PPC is a growing concern. The basement meeting room was packed, with few seats available and dozens of people standing in the aisles around the seating area. And, when one of the organizers asked how many people were attending for the first time, at least fifty people raised their hands. The boost in attendance may have been due at least in part to the presence of the Rev. Dr. Liz Theoharis, a Michigan native who is also the co-chair of the national Poor People’s Campaign movement along with the Dr. Rev. William J. Barber, who in 2013 began the “Moral Mondays” protests in North Carolina. The Poor People’s Campaign, which is organized and active in more than thirty states and in Washington DC, is modeled on the Moral Monday movement. Poor People’s Campaign Co-Chair the Rev. Dr. Liz Theoharis, at the Capitol on June 4. 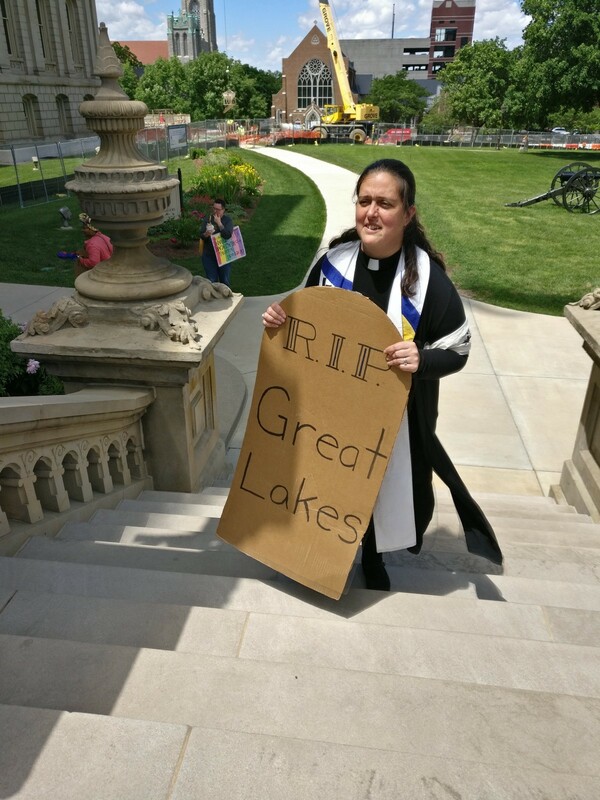 Calling Michigan “ground zero,” Theoharis addressed the issues of water shut-offs, denial of healthcare, and threats to water quality like the ones posed to the Great Lakes by the Enbridge Line 5 pipelines. “When people have our backs against the wall, all we can do is push,” she said. In 2017 alone, the Detroit Water Department denied water to one out of ten homes due to non-payment. 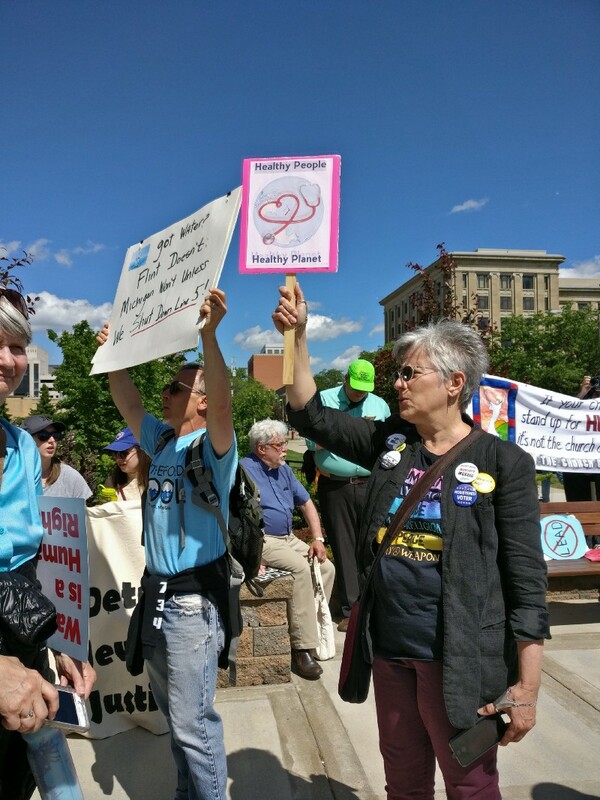 After hearing from Theoharis, activists from Flint, indigenous activists, and getting a chance to practice the day’s songs, the diverse crowd of PPC protesters — many of whom had indicated that the PPC actions were their first-ever protests — assembled for the march up Ottawa street to the state Capitol building. After gathering to hear speakers on the Capitol steps — including a Flint woman who claims the poisoned water in her city caused her to suffer two miscarriages — the activists took over South Capitol Avenue to hold a “trial” of Governor Rick Snyder in front of the George W. Romney building, which houses the governor’s offices. 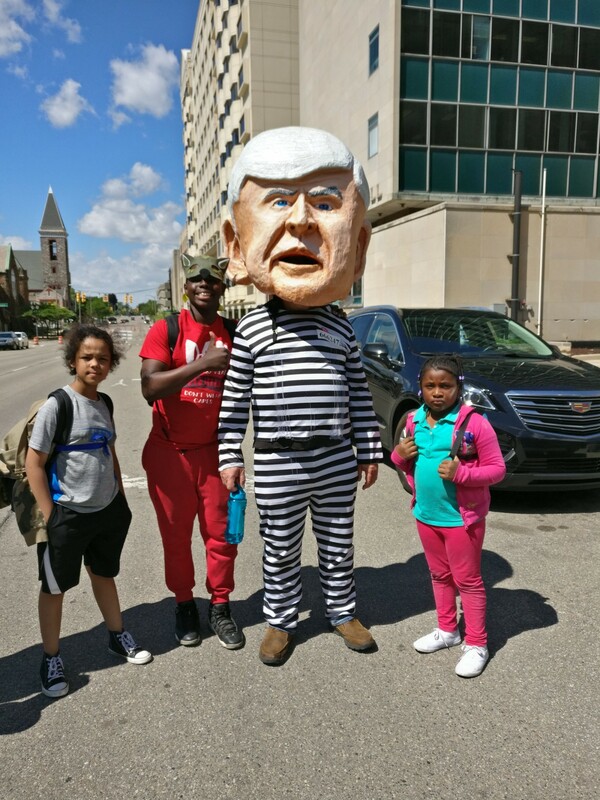 “Governor Snyder” being led away by children he has harmed after being convicted of “Crimes Against the People,” many of which are tied to Michigan’s emergency manager law. The plaintiffs, all children, included a young girl from Flint who said that the poisoned water in her city killed one of her pets. In addition to the ongoing Flint water crises, the governor was found guilty of “crimes against the people of the state of Michigan” including, “mass water shut-offs in Detroit, the dismantling of Detroit Public Schools, vandalism of civic trust, and other crimes of Emergency Management,” according to a flier handed out by members of the People’s Water Crimes Tribunal of Detroit. The governor was represented, complete in jail uniform, by a protester wearing a hand-made costume complete with an over sized, paper-mâchéd head. 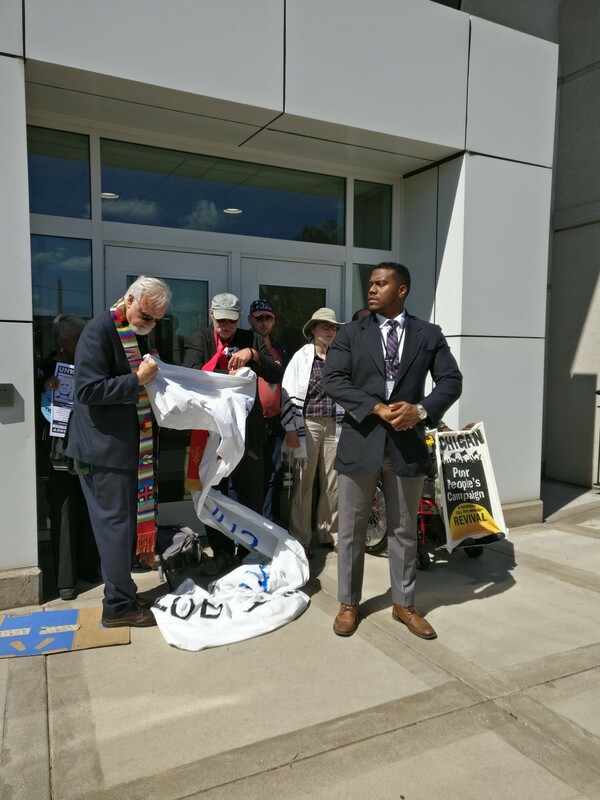 After the costumed representation of Michigan’s governor was led away in handcuffs by some of the child plaintiffs who had charged him, the Michigan PPC protesters then took their action, and their ire, to the home of Michigan’s Department of Environmental Quality in Constitution Hall. The group, still over 500 strong, arrived at around 4pm. 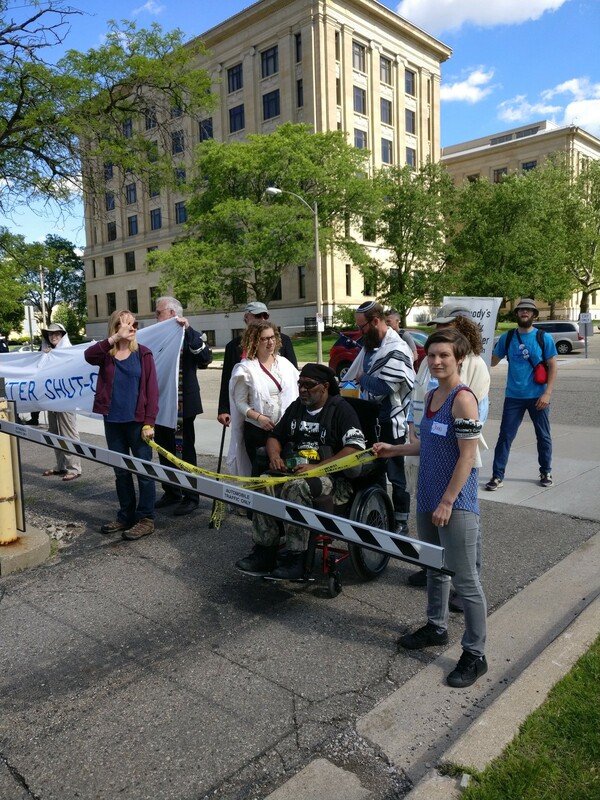 Activists assembling to block one of the doors to Constitution Hall, which houses Michigan’s Department of Environmental Quality — or “Department of Environmental Exploitation,” according to one protester. Not shown: Dr. Justin Sledge, who was assaulted at this door several moments after this picture was taken. As the bulk of the activists circled the building, specially-trained volunteers took up stations blocking the doors. In addition, the protesters used over 6,000 feet of yellow caution tape to circle Constitution Hall — because, according to an organizer, “we weren’t able to get actual crime scene tape” after deciding to add this visual element to the action. 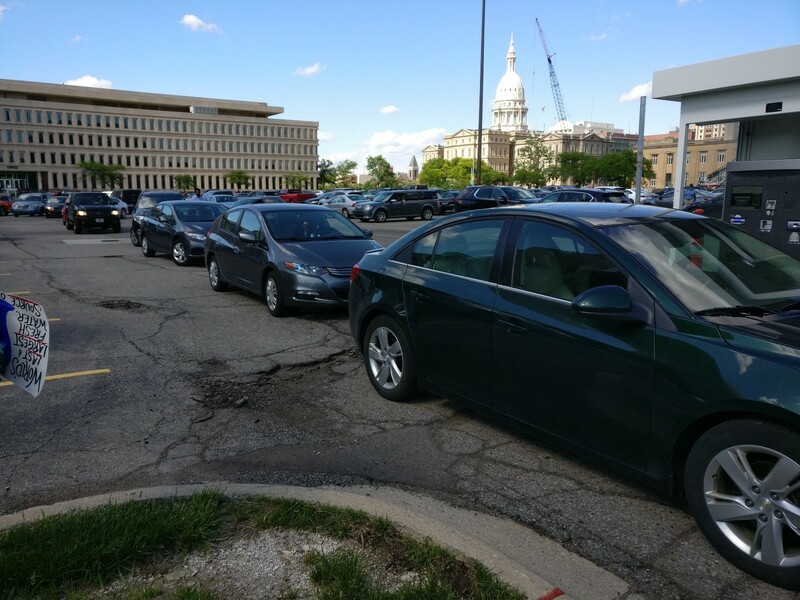 While activists engaged in a symbolic blockade of the “crime scene” of the Michigan DEQ, employees were able to leave — I personally witnessed dozens of individuals leave the building from a door on West Washtenaw Street closer to South Walnut Street throughout the time that PPC protesters were at the doors. 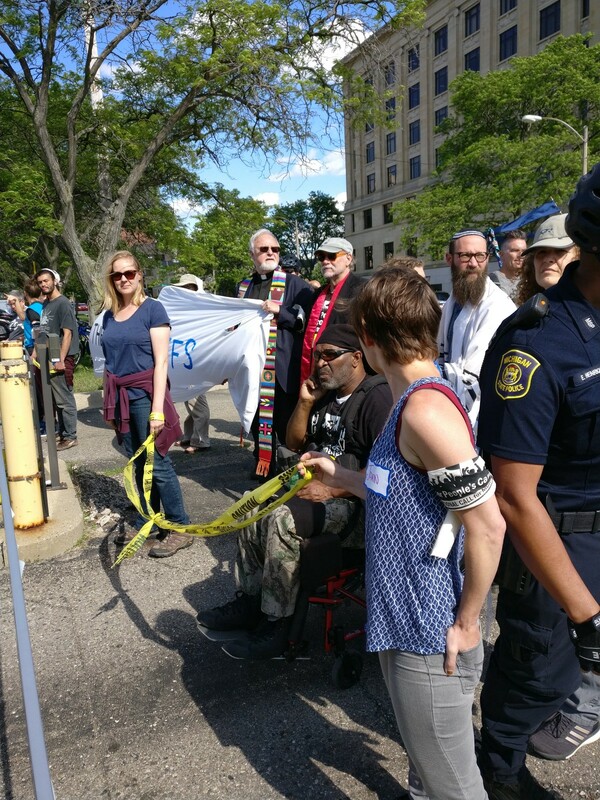 When the door blockade failed to lead to arrests — a major strategic tactic of the Michigan PPC — the activists moved to block exits from the Constitution Hall parking lot on West Washtenaw and West Allegan streets. Before they made their move, however, one activist was assaulted by a woman who forced her way out of the building where I was stationed, at the door closer to Pine Street. And while Michigan State Police were on hand to arrest activists for blocking traffic at the parking lot, neither of the officers stationed about ten feet from where the assault occurred detained the assailant. Michael Ruddock of Lansing came out to welcome the Poor People’s Campaign. Activists received a more mixed reception at the DEQ. 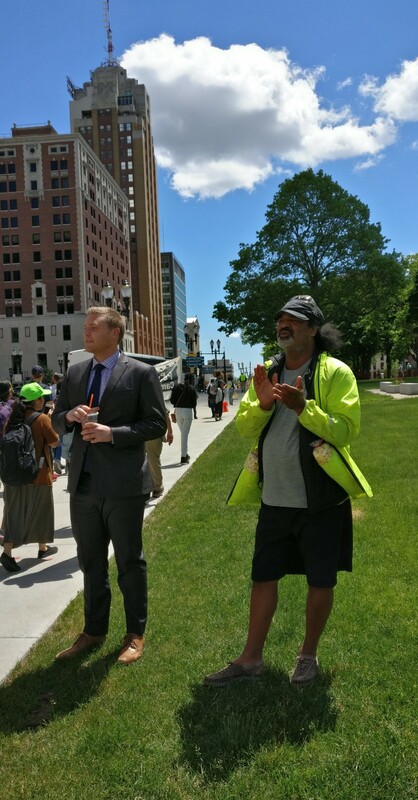 While local media coverage of the Michigan Poor People’s Campaign has been sparse at best, the word is starting to get out — and one man, Michael Ruddock of Lansing, took time out from his work to welcome the activists as they proceeded up South Capitol Ave.
“I heard about this, and wanted to give them a thumbs-up and a smile,” Ruddock said. Outside of Constitution Hall, the reception was decidedly more mixed. One gentleman leaving the DEQ building who didn’t wish to be named told me that he was “glad you’re (the activists) are here,” as he left the building, in his sharp, blue-pinstriped shirt. At least one woman, however, thought that an act of violence was the appropriate response to finding protesters, including Dr. Justin Sledge, delaying her ability to leave. Video filmed by Detroit Jews for Justice and shared on that organization’s Facebook page clearly shows Sledge and other activists being shoved from behind. Then, Sledge’s prayer shawl is grabbed and thrown over his head. At that point, a Michigan State Police officer intervened but did not detain the assailant, who was identified by witnesses as a white woman between 55–60 years old, who was accompanied by a white man in a black shirt. The woman, who was carrying scissors which she used to cut through a section of the caution tape behind held by activists on the sidewalk, refused to reply to my questions. Her companion, however, claimed that, “we just want to go home.” He added that neither he nor Sledge’s assailant are DEQ employees. At least two other people expressed consternation, but no violence, with the PPC protesters who blocked exit from the Constitution Hall parking lot. Blocking the parking lot at Constitution Hall. Later in the evening of June 4 Eunice M. Link took to the Michigan Poor People Campaign’s Facebook page to express her support for the group’s aims, but not its execution. “Seriously it isn’t fun and games at work, and seeing friends not able to go home at the end of the day…,” she wrote. “You want to get arrested. Take it to the legislators the policy wonks… Not the people who go home and face the same issues you are protesting.” Link wasn’t available to answer follow-up questions in time for my deadline. Another person, one of the PPC protesters, said that she had also spoken with a member of the public at the parking lot who expressed similar concerns. The activist, a woman from Ann Arbor who had not confirmed whether or not she wished to speak anonymously in time for my deadline, said that she thought the person had a valid point. Meanwhile, during the blocking action itself, one of the PPC’s spokespeople had an answer to those concerns. “We’re inconveniencing a few people, but is it ‘inconvenient’ not to have water just because you can’t pay for it?” he said. I'm a freelance writer & journalist in Ann Arbor, Michigan.